The United States will keep about 1,000 more troops in Afghanistan than planned early next year to fill a temporary Nato troop gap in the new mission to train and advice Afghan security forces, US Defence Secretary Chuck Hagel said Saturday on his final visit to this war-weary country as Pentagon chief. At a news conference with President Ashraf Gani, Hagel said the original plan to cut US troop levels to 9,800 by the end of 2014 had been abandoned, but not because of a recent surge in Taliban attacks. Hagel said the US will keep up to 10,800 troops for the first few months of 2015 and then restart the drawdown, which is scheduled to reach 5,500 troops by the end of next year. 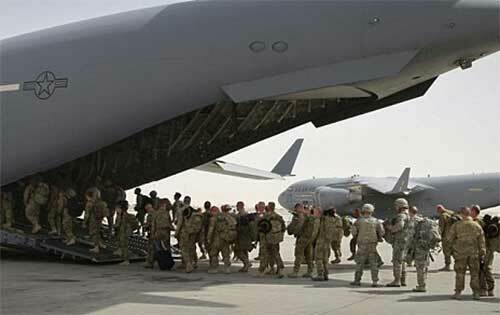 The US decided to keep additional forces in the country temporarily because planned troop commitments by US allies for a Nato train-and-assist mission starting in January have been slow to materialise. Gen. John Campbell, the top US commander in Afghanistan, told reporters in an interview later Saturday that he is confident Nato members will furnish the necessary number of troops for the new training mission, which begins January 1. It’s just going to take a few extra weeks or months to get them in Afghanistan, he said. Campbell, who took over on August 26 and has served two previous tours in Afghanistan, spoke glowingly of the new government led by Gani and Chief Executive Abdullah Abdullah. “It’s like night and day difference dealing with this government,” compared with the previous government led by Hamid Karzai, who was often publicly critical of US military efforts against the Taliban insurgency, Campbell said. Campbell said the morale and confidence of Afghan forces have been boosted by Gani’s enthusiastic embrace of their efforts and sacrifices. While flying to Kabul from Washington, Hagel was receiving almost continuous updates on the US commando raid in Yemen to rescue an American hostage, photojournalist Luke Somers. The mission was executed while Hagel was aboard a military aircraft with top-secret communications systems. He approved the plan for President Barack Obama’s consideration before leaving Washington, according to a defence official who spoke on condition of anonymity to discuss internal deliberations.